Discussion in 'Buying Tips and Advice' started by lanray, Oct 30, 2006. The right index finger appears to have suffered a dislocation or fracture. you mean you can't bend your finger like that?! I can, just touch the bottom of one to the nail of the other. Dude, that's some major double jointage right there. WTF is this thread about? Buying a.....finger? I don't get it, either. That pic doesn't look abnormal to me. I had a friend once who could bend all 8 fingers back to touch his wrists, now that was a little much. Now lets concentrate on the item being advertised. Is that a pair of Levis jeans? yes, but he is bending his finger at the knuckle, not at the joint that binds it to the hand. As a hand model, I can tell you: fingers do not bend like that. As a guy who saw the picture, and picked up a post-it pad about that size, I can tell you, fingers *do* bend that way. Nothing to be worried about. Yes they do. Do you all not see the way the knuckle is pointed outwards? That means that the joint is bending normally, only the finger itself is twisted slightly where it meets the hand. This is really only possible when pressing it against the middle finger, or the object you are holding, like she is clearly doing in the image. The knuckle isn't pointed out that far. I tried out what you were describing because I'm at home sick and waiting for Barry Manilow to come on TV. So I drew an iPod on some post-it notes and awkwardly took a picture or two. Here, just holding it normally. As can be seen, the portion of the finger from hand to knuckle are parallel. and here, I tried to bend my hand around like in the picture. (It hurt like all get-up and my tendinitis is flaring up due to the weather. owie!) the fingers are no longer parallel in the hand-to-knuckle section. what it looks like happened to me, the person doing the modeling was covering up too much of the iPod's "face" and the graphic guy moved the finger over just enough so that it would be shown. I've put way too much thought into this and hurt myself in the process. it looks like my work here is done. Everything about that post made me laugh, but it proved very little. Everyone's body is different, and while my fingers don't typically look like the person in the ad's fingers when I hold things, I don't have any problem moving them in that way if I purposely try to. This is why I say it's not a deformity, just kind of weird. If I had a camera, I'd demonstrate. That said, you would think whoever took this shot would look at it and go "Hm, that looks kind of awkward. Perhaps I should use a different shot...". I think the point is, a finger model for an ipod... shouldn't have fingers... LIKE THAT. The infamous hand modeller strikes again! Definitely not, they should have katie ta achoo's hands. just noticed this now. I thought the person in the pic was a man? definitely! he should know ahead of time that after the pic gets released that it'll be picked apart by mac rumor sites! I think the NDA would just about kill me. That's what I thought too  the knuckle looks a bit smudgy and weird. I know! You'd think that'd be the first thing on his mind! I think it's all about finger yoga. What is also being missed is the pressure on the man's hand in the pic in question. He is pushing against that finger, that is why it is at a weird position in relation to the other fingers. 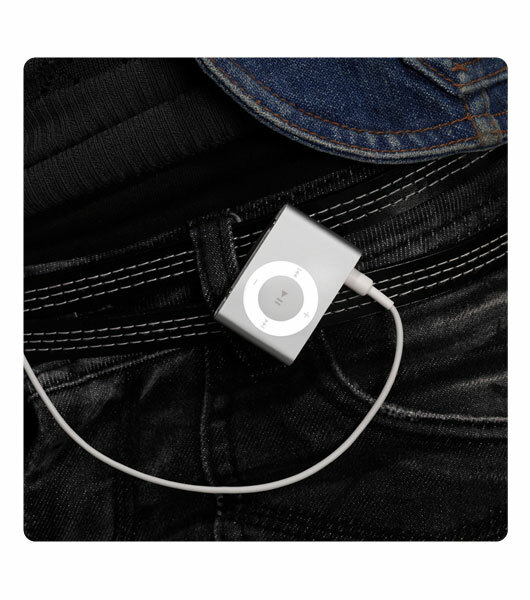 The pushing/pressure is to open the Shuffle clip to hook it onto the jeans. Presumably the strange looking angle is just the way his finger is, and the fact that it is twisted slightly. And yes, Katie's hands would be a better choice. By you. Geez, I thought I read your post. Guess not very well.